Happy (deep state) birthday to me! I blog every Wednesday, and it just happens that today coincides with my birthday. So I had a really good writerly topic I was going to expound on, and in doing so, I needed to look up a particular source I’d link to. 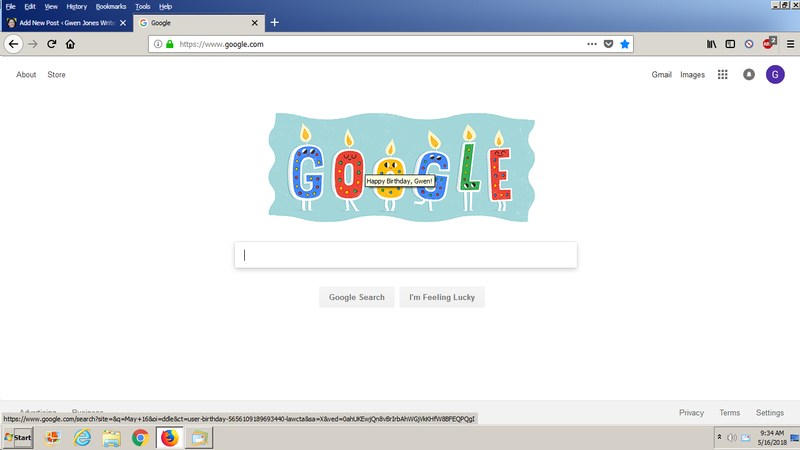 So I go to Google and lo and behold, there is this doodle staring at me wishing me Happy Birthday, Gwen! (click on it to get the full impact of its exuberance). Okay, creepy enough, but how is this happening? Because Google knows everything about you, sweetheart! Nothing is secret anymore! Well, happy Wednesday to you, big brother!